When poultry farming was a promising business in the mid-1970s, there were two high school students in the Jeolla provinces showing their business acumen from an early age. One was Kim Hong-kuk, a student of Iri Agricultural High School in Iksan-si, North Jeolla Province. Born in 1957, Kim’s grandmother bought him 10 chicks when he turned 11. He sold the chickens once they grew up, and used the profit to buy more chicks. By 1975, he owned over 1,000 chickens -- and was also in his first year of high school. And there was Woo Oh-hyun, who was a student at Gwangju Commercial High School in South Jeolla Province. Born in 1953, Woo was in the third year of high school in 1971 when he started poultry farming. Later, he became acquainted with Kim Hong-kuk and with a mutual understanding they jointly operated the poultry farm, making large profits every year. They ran the farming business together until 1978, when Woo sold the business to move onto the construction industry. Years later, the two former partners went on to create their own conglomerates. 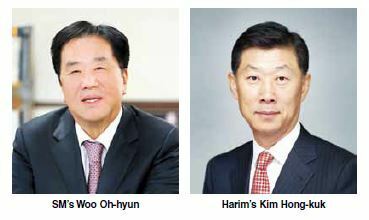 Woo, now 64, has founded Samra Midas Group, while Kim Hong-kuk, 60, became CEO of Harim Group. Through active mergers and acquisitions, the two each enlarged their companies, and became rivals in the shipping industry. SM Group jumped into the bulk carrier industry by taking over the country’s fourth-largest shipping company Korea Line, which was undergoing legal management in 2013. Harim Group took over STX Group’s core subsidiary Pan Ocean in 2015 and entered the shipping business as well. Having operated the poultry farm, Kim established Harim Food and entered the food manufacturing industry in 1986. In the 1980s, when the Asian Games and Seoul’s Summer Olympics took place, the demand for chicken had exploded, and Harim continued to expand. He also took over Jeil Feed, and established premium chicken company Orpum as well as home shopping subsidiary NS Shopping in 2001, creating the fundamentals of Harim Group. From 2002 onwards, he took over Joowon San Ori, Sunjin in 2007 and Farmsco in 2008. He has continued his efforts to affiliate more subsidiaries until even recently. In 2015, he took a further leap from the poultry business to jump into new industries like shipping. He transformed his company into a large enterprise with an asset value of 9 trillion won ($7.65 billion), including the livestock and distribution business. Last April, NS shopping’s subsidiary company, n.Bicorn, bought the Pi-city site in Yangjae-dong, Seoul (formerly Yangajae-dong Cargo Terminal) that spans 91,082 square meters and is worth 452.5 billion won. Kim said he is planning to build a high-tech industrial distribution base and urban research and development center in this area. Harim Group, which owns 58 domestic subsidiaries, has two holding companies: Jeil Holdings and Harim Holdings. Jeil Holdings is an unlisted company producing and selling assorted feed for livestock and owns 68.09 percent of interim holding company Harim, which is listed on the Kosdaq and acts as its practical holding company. Jeil Holdings is the largest shareholder of listed companies, such as Sunjin and Harim, and also takes control over other unlisted companies like Jeil Feed. Jeil also holds indirect control over other unlisted companies such as NS shopping through Harim Holdings. The ownership family’s share of the holding company is not too high. Kim holds 8.14 percent of the shares of Jeil Holdings, 0.68 percent of Harim Holdings and 5.12 percent of NS shopping. The appraised value of his shares in the listed firms is 30 billion won, but including unlisted assets, his assets jump to 200 billion won. His share of the unlisted company Jeil Holdings (8.14 percent) accounts to 150 billion won based on total ownership interest standards. The appraised value of his shares in Jeil reaches about 150 billion when taking into consideration his total equity. Currently, his eldest son Kim Jun-young, 25, virtually holds leadership of the entire group through his company Orpum. Kim Jun-young owns 100 percent of the unlisted chicken manufacturing and storing subsidiary, Orpum. Orpum had been owned by the father in the past, but he handed all the shares to his son at the end of 2012. In 2015, out of Oprum’s total revenues of 359.1 billion won, 74.5 billion won came from its subsidiaries, meaning internal transactions accounted for 20.7 percent of the revenue. Orpum holds 100 percent of shares in the subsidiary Korea Thumb Vet, which holds 7.35 percent of Jeil Holdings. This makes Kim Jun-young the second-largest shareholder, following his father. Woo entered the construction industry by chance. After he was swindled by a local construction company on building a one-story house in 1978, Woo was forced to complete the construction himself. But he soon realized he could reap significant profits by reselling the home, and so set up his own construction business. Later in 1988 he established Samra Construction, which had focused on the rental apartment business in Gwangju. In 2001, he expanded his business. Samra Construction later grew into SM group, with an asset value of 4 trillion won and 35 subsidiaries. Woo was able to develop the firm rapidly due to aggressive mergers and acquisitions. He took over firms that were undergoing workouts programs or legal managements, and carried out intense restructuring to normalize the management. The first case was Jinduk Industrial, now Woobang Industrial, in 2004. He took over battery producing enterprise Bexel in 2005, fabric and clothing enterprise Kyungnam Textile in 2006, Namsun Aluminum in 2007, synthetic enterprise TK Chemical in 2008 and Woobang in 2010. In 2011, he also took over Hiplus Card and Shinchang Construction, now Woobang Construction. Last year, he also succeeded in incorporating Sungwoo Construction and Dong-A Construction. Such aggressive moves allowed SM Group to increase its revenue from 75.4 billion won in 2004 to 2.5 trillion won in 2015. Woo is the largest shareholder of Samra and owns several subsidiaries. SM group’s listed companies include Namsun Aluminum, Korea Lines and TK Chemical. There are also 32 unlisted subsidiaries. Among the listed companies, Woo only owns 4.42 percent of shares in Namsun Aluminum. The rest of his shares are in unlisted subsidiaries. Woo holds 60.96 percent of shares in Samra, the mother company as well as the de facto holding company of the group. He also holds shares of the following: Samra Midas (100 percent), SM Holdings (45.46 percent) and Kyungnam Textile (10.37 percent). The appraised value of his shares, including those for Namsun Aluminum and four unlisted subsidiaries, amounts to nearly 300 billion won. 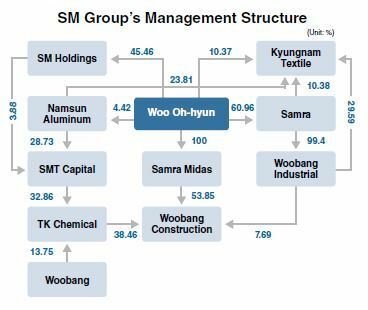 Woo’s shares of Namsun Aluminum account for approximately 7 billion won, but shares of Samra and the four unlisted subsidiaries are worth at least 270 billion won. The ownership family has mostly kept a low profile. Woo has a son and four daughters, but his children do not own any shares of the SM Group’s subsidiaries.